Check out The Meatrix...from Sustainable Table to see why locally grown meats are better for animals, humans and the environment. This is why we do what we do at Stark Hollow Farm. Here is a little example of what our wonderful animals could so someday! 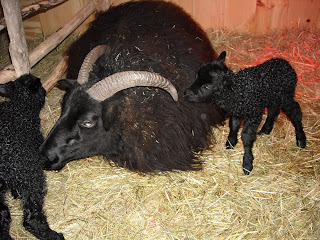 Poppy gives birth to Stark Hollow Farm's first lambs. 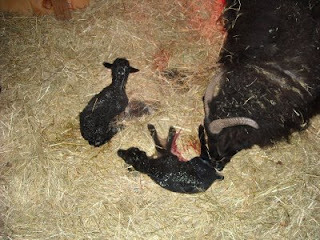 Ewe lamb Alba and ram lamb Ansel were born March 25th, 2009. 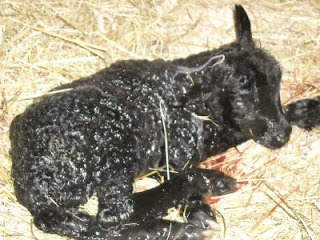 It was exciting and a little scary this being our first lambing. Both lambs presented normally and Alba was up nursing within 20 minutes. 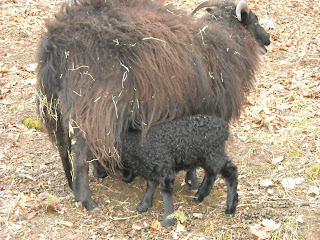 Her little brother, born 10 minutes after her, was a somewhat slower to get going. We intervened to express milk from Poppy so that he got good colostrum and had to help him find his mother's teats. It took a couple of hours but now he is plump and frisky growing even more quickly than his sister. 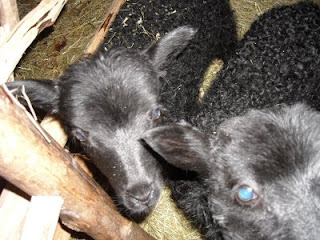 They are beautiful, healthy lambs. Poppy is a great first time mother. Very attentive to her lambs and quick to care for and protect them. She has produced a lot of milk and the lambs are fat & happy.